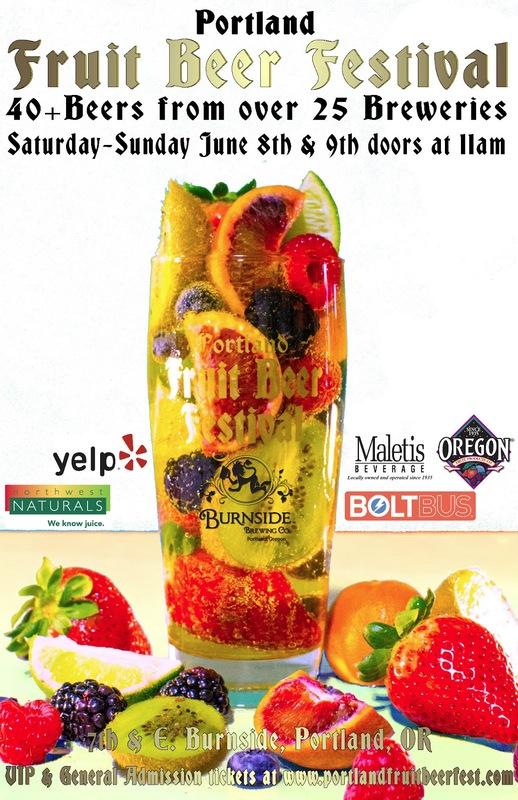 The 3rd annual Portland Fruit Beer Festival is back for another round this June 8th and 9th during Portland Beer Week and will feature more than 25 breweries and 40 delicious fruit beers. Held outside of Burnside Brewing on 7th & East Burnside, the fest has expanded along the side street to accommodate fruit-crazy beer fans. The taplist and brewery list is curated by yours truly, and this year’s lineup promises the largest variety yet. In fact, I believe everything but 2 Towns Cider is made specifically for this year’s festival. For those who think fruit beers are not their thing, or that they are some kind of “girly,” the beers here may blow your mind. One of the beers I am most excited about is a Mango IPA from Stone Brewing; this is a beer that Stone Brewmaster Mitch Steele is making specifically for this year’s Portland Beer Week and Fruit Beer Festival, and was described to me as basically a take off their popular Ruination Double IPA. Veronica Vega at Deschutes’ Bend Brewpub has concocted an elaborate Baltic Porter that has been soured and has the addition of both currants and raspberries. Bushwhacker Cidery and Upright Brewing have done it again with a new collaboration blend of cider, Barrel-Aged Upright Six with Raspberries, and the addition of a 3rd fermented beverage – mead. Breakside Brewing-Strawberry Rhubarb Pie Beer for the 2012 Portland Fruit Beer Festival from Ritch Marvin on Vimeo. The only returning beer from last year’s festival was the best seller, Breakside Brewery’s Strawberry Rhubarb Pie beer that used whole pies throughout the brewing process. 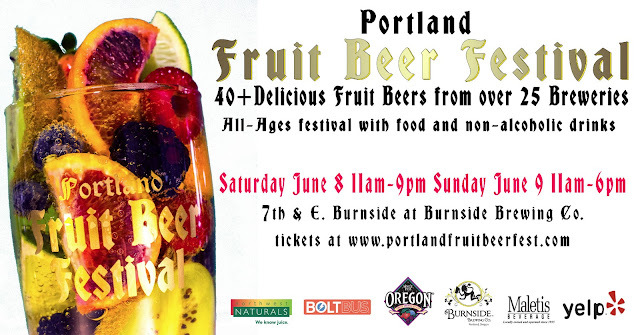 Taking place outdoors in front of Burnside Brewing Co. on 7th and E. Burnside for its 3rd year with even more space with the addition of the 7th street closure, the PFBF is one of the most centrally-located and family-friendly festivals in the state. The all-ages festival has something for everyone, including hard cider for the gluten intolerant, killer food from the Burnside Brewing kitchen, and juices and sodas for non-drinkers. Purchase your regular entry tickets in advance and bypass the cash lines going straight to the front. Includes one gold flaked festival glass (required for tasting) and 12 drink tickets, each good for one 4oz taste (some beers require 2 tickets).Tickets now on sale! Additional tickets are $1 and good for 4oz of beer (with some exceptions) and a full pint for 4 tickets, unless it’s a 2-ticket beer. 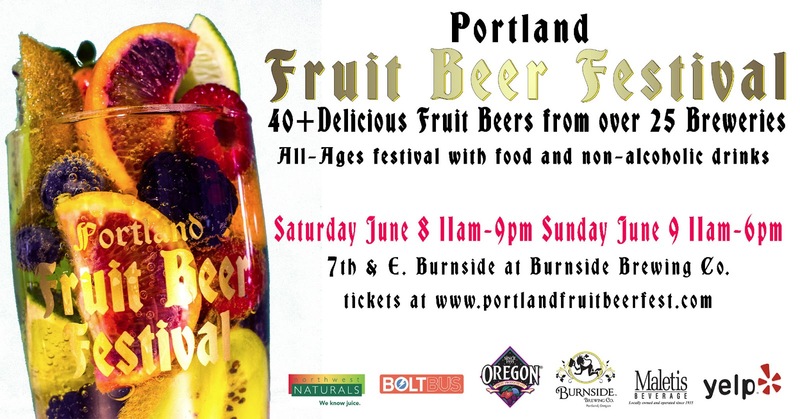 For the 3rd year the Portland Fruit Beer Festival presents an all-fruit beer homebrew competition. This is an non-BJCP style open competition; any homebrewer, club or not, from any state, may enter. Fruit beers are among the more challenging beers to brew, and there are many different methods and theories behind how to best utilize fruit, from fresh to puree, dried and juiced, the options are numerous. To keep the categories of entry simple we have narrowed down the style guidelines to 5 distinct categories of fruit beer (Light, Dark, Sour, Spice/Herb) and are adding Hard Cider to the competition this year. This year entries will be divided into five simple categories: Light Colored (12 SRM and lower), Dark Colored (greater than 12 SRM), Sour, Spice/Herb, and Hard Cider. The Best of Show will then be determined from the winners of those categories. Your beer will be judged with simple sensory analysis sheets designed to give feedback without regard to total overall score. Prizes for each first place in the three categories are a $20 gift certificate to Burnside Brewing. The Best of Show grand prize will win an additional $50 gift certificate! The winners will be announced on Saturday, June 8th, at 12pm during the festival. Entries will be accepted at Burnside Brewing and F.H. Steinbart’s from Sunday, May 19th to Friday, May 31st by the end of business with judging to commence the following Saturday, June 1st. Each entry costs $7, but you get three beer tickets and a 16oz gold flaked glass in return! Please make check or money orders out to “Oregon Brew Crew” with a memo of “PFBF Entry Fee”. There are no limits to the number of entries any one brewer may enter, but any one beer must be entered into only one category (no spamming multiple categories with one beer). Each entry must consist of two unmarked 10 – 22 oz. bottles accompanied by a AHA bottle ID form: http://www.bjcp.org/docs/SCP_BottleID.pdf filled out and rubber banded to each bottle. When filling out your entry forms, please specify all fruit(s) used and (if applicable) all spice/herb(s) used. You don’t have to give a recipe, but we must know the extras beyond the grains that comprise the brew. As well, please specify the category you are entering the beer or cider in or it may be miscategorized. Please be advised that bottles missing the above form or using tape or sticker of any kind will automatically be disqualified without refund. *No exceptions*. Like last year Burnside Brewing will be holding a Pre-Fest Homebrewers Dinner on Wednesday June 5th 6pm at East Burn. We will pour some of the best homebrewers’ fruit beers at the private dinner. If you can provide up to 5 gallons of your fruit beer homebrew competition and would like to be considered for the dinner please write it in on the form. Accepted applicants will get a free ticket to the dinner with fellow homebrewers and pro brewers, including Jason McAdam from Burnside Brewing and Stone Brewing co-founder Steve Wagner, who will present early samples of Stone’s first-ever fruit beer, a Mango IPA. More dinner details TBA. Burnside Brewing is graciously donating a sum of money to the OBC for its help in the competition. You can show your support and thanks, if you are a licensed OLCC server, by volunteering to pour beer for a paid shift during the festival. Contact Holly Emery-Wallen about pouring at the festival at hollyemerywalen@gmail.com. The general festival info page is here.